Buy-One-Get-One(-Free) is a proven sales tactic with many variations. No need to worry about your losses: experienced merchants know that BOGO(F) sounds much more appealing for customers than it actually is. Few customers are good at math, so a fancy offer works, and BOGO(F) remains popular among merchants to lure customers. Let’s see what makes for a successful BOGO(F) sale and what variations you can apply in your store. Expendable. If customers like your product (body cream, for example), they’ll come back for more when they run out of it. Usable in two. You don’t want to offer two similar jackets, do you? Two pairs of socks for the price of one are much better. With at least a 50% margin. If your product’s margin is 50%, then your sale is break-even. Try to include at least one product with a higher margin to come out ahead. The total price of the deal should fit the amount that customers are ready to pay. To be on the safe side, you can check out your average order value and aim for a little bit more. A BOGO(F) promo is normally run within a time limit. It creates a sense of urgency, pushing customers to making a purchase. On the other hand, a flash offer prevents customers from getting used to buying on the discount terms. The mechanism of BOGO(F) is very flexible. There are five variations we’ll look at — choose the one that works best for your product range and goals. If you have a bestseller in your store, this tactic will work great for it. A BOGOH (-Half) will attract and activate those who have been hesitating to try it. With this great deal, customers will buy your legendary stuff, love it, and come back again soon. Pairing products from different categories can make a great deal for seasonal products or certain groups of targeted customers, for example, students and their parents (Back to School BOGO). The only condition to remember is that the second item must be of equal or lesser value. By giving away free samples, you allow your customers to feel the real product. Samples might look like a gift, but they are also an investment into the future demand for your products. Include exclusive samples of your new product line to introduce it to your customers. It’s not about physical goods only: a great way to get more reads of your e-books is to provide short samples. This way you don’t lose anything. Samples are much less likely to be stolen, copied, or distributed illegally. But if your customers love the content, they’ll come and buy the whole book. This is one of the most common variations of BOGO. It works for many product types and looks like a very cool deal. Remember to keep the terms simple: include items with similar prices — it will simplify perception and prevent hesitation. This is an easy-to-implement tactic for industries with a lot of complementary products: sports, beauty, electronics. Say you sell a pair of sneakers and give a 30% discount on the footwear cosmetics. 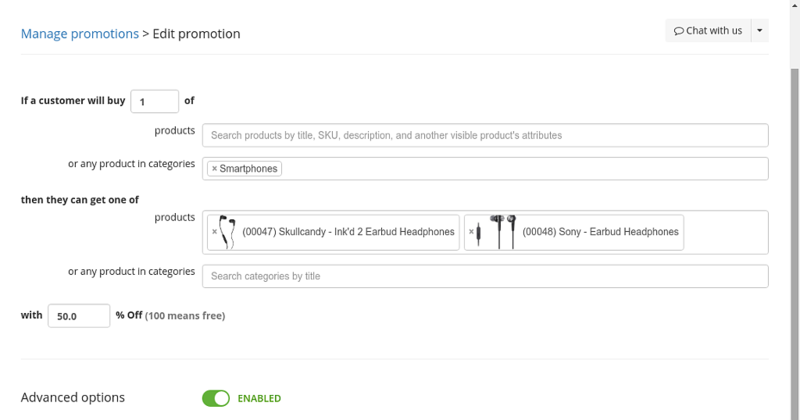 This type of promotion can help you sell out accessories. The BOGO(F) types described above can be implemented with the BOGO app from the Ecwid App Market. Start the 14-day free trial to try the BOGO app before the holiday season sales. Have you run BOGO(F) in your store? Were you happy with the results? Share your experience in the comments below.